In this section we highlight intellectual schools of thought that can provide a framework for excellence. The Flourishing Enterprise Innovation Toolkit is a new set of tools and methods created to help enterprises and their investors to collaboratively design ways to improve their financial, social and environmental performance. The toolkit can help organizations with goals anywhere from purely financial viability to ones “doing good to do well” by enabling the identification of the risks and opportunities relevant to their chosen objectives. The toolkit uses the proven business model lens to enable leaders to collaborate more effectively to understand, explore, diagnose, improve, design and tell stories about their enterprise in its entirety. At the heart of the toolkit is the Flourishing Business Canvas, a visual design tool that provides a common language and structure for collaborative design. Through economic, social and environmental lenses, the canvas asks the essential questions an enterprise needs to consider in order to work towards flourishing. While helpful to organizations with any range of goals, the Toolkit and Canvas are specifically created to support business leaders in their efforts to design flourishing enterprises; businesses that are socially beneficial, environmentally regenerative and financially viable. Our vision is a world where human enterprises no longer merely attempt to do less harm, but instead set at their core the goal of sustaining the possibility for human and other life to flourish on this planet for seven generations – contributing to the realization of the UN Sustainable Development Goals and beyond. Many traditional practices are no longer delivering the results that are expected or needed. There are pressures to perform, to meet changing expectations of government and to build trust that government can meet the needs of citizens. There is a need to lift productivity and effectiveness, and to work with citizens in new and more inclusive ways. This means that they need to systematically put in place processes for the identification of problems, the generation of ideas, the formalization of business cases, implementation of promising projects, evaluation and the diffusion of results. Enabling Conditions: What are the enabling conditions that encourage organisations and individuals to reflect and allow people to challenge existing ways of thinking? Channels for Learning: What are the channels for learning? How is new intelligence about the world and the changing operating context accessed? Tools: What are the tools that can be used to reveal current assumptions? That can best demonstrated the difference between ‘what is’ and ‘what is wanted’, and provide insight into how to respond to that gap? 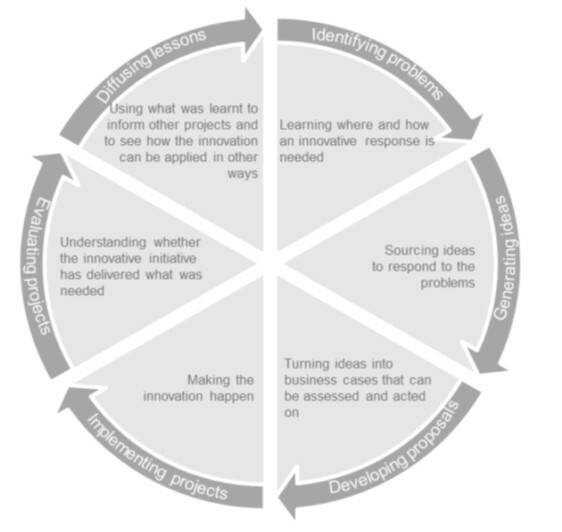 X-Factor – recognising that each organisation is different, and will need to assess their own context and learning for innovation needs. Where is the organisation currently learning from? Which channels provide the most surprises or unexpected learning? Are there any big gaps in these channels for learning? Do any of these channels allow the organisation to challenge existing knowledge, and to potentially encourage it to ‘unlearn’ fundamental assumptions or investment in the status quo?